Mark Lowcock, Under-Secretary-General for Humanitarian Affairs and Emergency Relief Coordinator, attends a news conference on his visit to Bangladesh for the Rohingya refugee crisis, at the United Nations in Geneva, Switzerland October 6, 2017. GENEVA - Muslim Rohingyas continue to flee Myanmar to Bangladesh and the United Nations is bracing for possible “further exodus”, the U.N. humanitarian aid chief said on Friday. 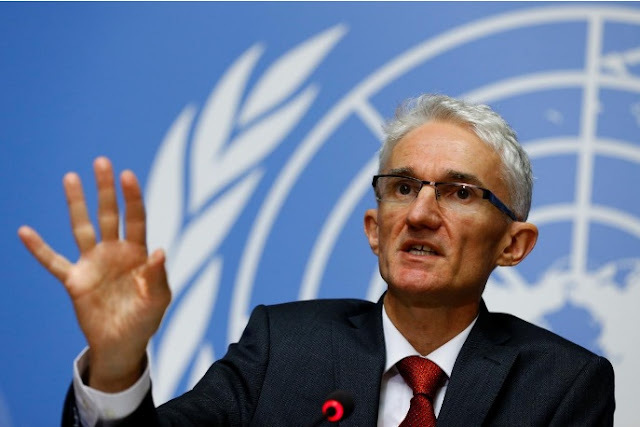 Mark Lowcock, U.N. under-secretary-general for humanitarian affairs, reiterated the world body’s appeal for access to the population in northern Rakhine state saying that the current situation was “unacceptable”. An estimated 2,000 Rohingya are escaping Rakhine daily for Bangladesh, where 515,000 have fled since violence erupted on Aug. 25, Joel Millman of the International Organization for Migration (IOM) told a separate briefing. Muslim Rohingyas continue to flee Myanmar to Bangladesh and the United Nations is bracing for possible “further exodus”, the U.N. humanitarian aid chief said on Friday.